Virtually every company is interested in transforming its infrastructure and applications to take advantage of the cloud and a more flexible, efficient IT infrastructure. However, implementing a private cloud can be complex and daunting. 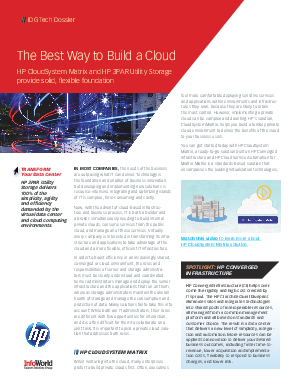 This report sponsored by HP + Intel outlines a strategy for getting the benefits of the cloud quickly. Learn about the solutions that can help you save time, improve storage efficiency and maintain a secure, available environment.